The Toronto Star has unveiled the startling results of an investigation that reveals, once and for all, the fragility of Canada’s food safety system involving horses. 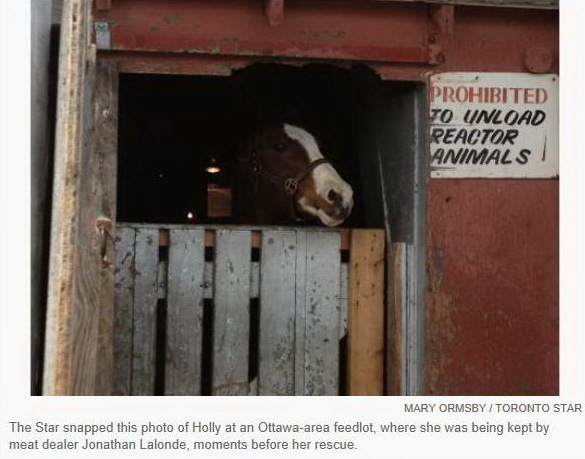 The compelling story of a rescued horse, “Holly”, appeared in the Star the next day, on May 25, 2013. This story reveals the ease with which drug-positive horses can enter the food chain. Based on evidence discovered by independent investigators, we call upon our supporters to demand answers from their Members of Parliament. It is time for all heads to come out of the sand and for the Canadian government to support Bill C-322 and initiate an end to the slaughter of horses – animals who have not been raised in accordance with food safety standards.